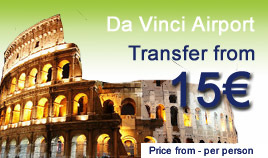 Rome airport transfer website : transfer between Leonardo Da Vinci Fiumicino FCO airport - Ciampino Airport and the Rome city center - service is either private or shared. Our website proposes a rental service offering chauffeur driven automobiles with drivers specialized in the door to door passengers transfer between either Leonardo Da Vinci Fiumicino FCO airport or Ciampino airport CIA and hotels in Rome. Please select the ground transportation of your choice : Shuttle to airport or hotel pick up. Private service is operated from Fiumicino Da Vinci Airport only - this service is a good bargain for groups of 4 or more. It is also the favorite of Senior citizens, travelers with heavy luggage, disabled persons, or families with small children in tow. Transfer is operated in comfortable air conditioned vehicles with courteous English speaking drivers. Please click on the "Book your Transfer" button and select the airport shuttle you need. Booking your Rome airport ground transportation online is an affordable, stress-free way to move between FCO and CIA airport and any destination downtown Rome. Ciampino Airport transfer is only operated in private vans - The more you are and the less you pay : For 8 people the cost per person is as low as 16 euros.